Available with a Bigsby® Vibrato! Epiphone is proud to present the debut of GRAMMY™ winner Gary Clark Jr’s premier signature model, the Epiphone Gary Clark Jr. “Blak & Blu” Casino, available with the legendary Bigsby ® Vibrato B700 Vibrato. 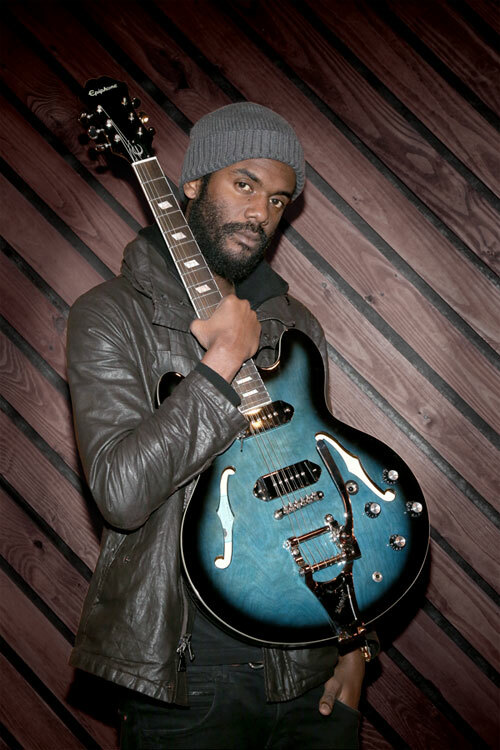 Gary Clark Jr. is one of the most exciting performers of our generation with a totally original style that fuses rock, pop, acoustic and electric blues styles, and rhythm & blues into a sound all his own that has made him a living legend to both music fans and musicians. Gary Clark Jr. is everywhere—on tour with the Rolling Stones and on stage with Eric Clapton or at the White House. But no matter where he’s playing, he’s never seen without his favorite guitar, an Epiphone Casino. Now, Clark has joined with Epiphone to commemorate his debut major label album, Blak & Blu, with a classic Casino design featuring Gibson USA P-90 pickups in a one of a kind Blak & Blu Burst color finish. The Casino has changed little since its initial debut in 1961. And for his premier signature guitar, Clark chose to keep the same classic Casino body shape and style that nearly all Casinos have shared since the early 60s. “I like the way Epiphone Casinos play right off the shelf,” said Clark. “To be honest, the original prototype of the new “Blak & Blue” was perfect as-is.” Clark’s new Signature “Blak & Blu” Casino is a Laminated Maple, 5-ply (Maple/Birch) hollowbody, the source of the Casino’s legendary chimey tones and easily controllable gritty feedback. The body is finished in Clark’s custom new “Blak & Blu” Burst color finish with single-ply white binding around the top and back. The Mahogany neck has 22 medium jumbo frets and a 1960's SlimTaper™ D Profile that’s inspired by the best vintage Casino’s in Epiphone’s collection. Like vintage models, the neck joint is glued to the body at the 16th fret. The scale length is a standard 24.75” with a fingerboard with pearloid "Parallelogram" inlays. The smooth fingerboard has single-ply white binding and a 14” radius. 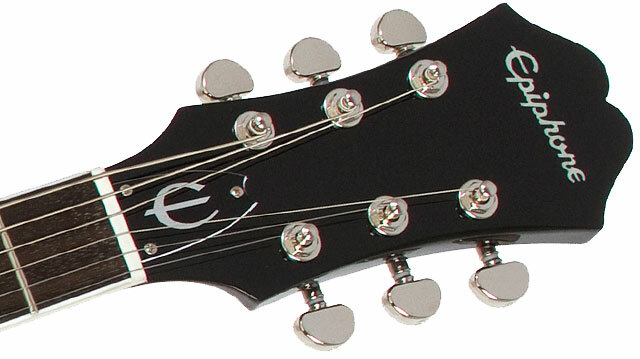 The sloped dovetail headstock, seen on virtually all Epiphone archtops since the early 60s, has a 2-ply (White/Black) "Bell" shaped truss rod cover with a vintage "E" in white and 1.68” nut. Though the Casino is a hollowbody, it’s perfectly balanced in size and sound. It’s easy to summon your own brand of dynamics on any size stage and at any volume. The P-90 single coil pickup first appeared in the late 40s in archtops made at the now- legendary Gibson & Epiphone factory in Kalamazoo, Michigan where the Casino was first designed in the early 60s. P-90s were originally intended as a powerful yet sensitive jazz guitar pickup. But they truly found their voice in the Epiphone Casino starting in 1961. 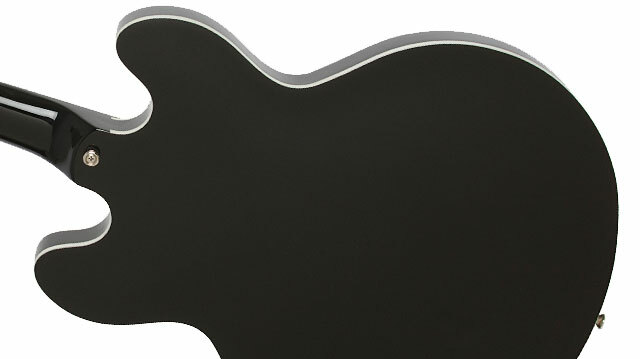 The thinline style body of the Casino, combined with the P-90’s mighty Alnico magnets, have perhaps powered more GRAMMYs and more groundbreaking recordings than any other pickup—from The Beatles and Rolling Stones to Oasis and Radiohead and now Gary Clark Jr.
Clark’s new Epiphone “Blak & Blue” Casino features the same legendary Gibson P-90 pickups, wound with the same attention to detail as the handmade originals with a P-90R in the rhythm position and a P-90T in the lead. Both “Blak & Blue” P-90s pickups are powered by standard Casino controls for volume and tone with a high quality Swithcraft™ 3-way toggle with a white cap and black washer. Like all Epiphone instruments, the Casino’s electronics come with Epiphone’s Limited Lifetime Guarantee for smooth and reliable use night after night. Epiphone leads the industry in making sure all of its instruments feature the highest quality hardware. The “Blak & Blue” nickel bridge is an ABR™ Tune-o-matic and Grover® Rotomatics™ 18:1 ratio machine heads make for easy and precise intonation. The Gary Clark Jr. Blak & Blu Casino also comes with the legendary Bigsby™ B700 Vibrato tailpiece.